George III was born on 4 June 1738 in London, the eldest son of Frederick, Prince of Wales, and Princess Augusta of Saxe-Gotha. He became heir to the throne on the death of his father in 1751, succeeding his grandfather, George II, in 1760. He was the third Hanoverian monarch and the first one to be born in England and to use English as his first language. He never visited Hanover! In his reign, which was longer than that of any British monarch before him, fell the gain of French colonies in Canada and French possessions in India (1763), but also the loss of a large part of North American colonies in the American War of Independence (1775-1783). The coalition wars against France, which lasted for more than two decades, ended in 1815 with the defeat of Napoleon in the Battle of Waterloo; British dominance on the oceans was also strengthened. George III is widely remembered for two things: losing the American colonies and going mad. This is far from the whole truth. George’s direct responsibility for the loss of the colonies is not great. He opposed their bid for independence to the end, but he did not develop the policies, such as the Stamp Act of 1765 and the Townshend duties of 1767 on tea, paper and other products, which led to war in 1775-76 and which had the support of Parliament. The declaration of American independence on 4 July 1776, the end of the war with the surrender by British forces in 1782, and the defeat which the loss of the American colonies represented, could have threatened the Hanoverian throne. Under this aspect this passport is also most significant for early American history. George III was King of Great Britain and Ireland from 1760 to 1801, then King of Great Britain and Ireland until his death. In the Holy Roman Empire he ruled as Elector of Brunswick-Lüneburg, since the Congress of Vienna as King of Hanover (1814). He was also the last British monarch to call himself King of France after the Hundred Years’ War. George’s accession in 1760 marked a significant change in royal finances. Since 1697, the monarch had received an annual grant of £700,000 from Parliament as a contribution to the Civil List, i.e. civil government costs (such as judges’ and ambassadors’ salaries) and the expenses of the Royal Household. In 1760, it was decided that the whole cost of the Civil List should be provided by Parliament, in return for the surrender of the hereditary revenues by the King for the duration of his reign. George III was the most attractive of the Hanoverian monarchs. He was a good family man and devoted to his wife, Charlotte of Mecklenburg-Strelitz, for whom he bought the Queen’s House (later enlarged to become Buckingham Palace). They had 15 children, 13 of whom reached adulthood. However, his sons disappointed him and, after his brothers made unsuitable secret marriages, the Royal Marriages Act of 1772 was passed at George’s insistence. (Under this Act, the Sovereign must give consent to the marriage of any lineal descendant of George II, with certain exceptions. ).Being extremely conscientious, George read all government papers and sometimes annoyed his ministers by taking such a prominent interest in government and policy. He was the first king to study science as part of his education (he had his own astronomical observatory), and examples of his collection of scientific instruments can now be seen in the Science Museum. George III also took a keen interest in agriculture, particularly on the crown estates at Richmond and Windsor, being known as ‘Farmer George’. After serious bouts of illness in 1788-89 and again in 1801, George became permanently deranged in 1810. He was mentally unfit to rule in the last decade of his reign and he became blind; his eldest son – the later George IV – acted as Prince Regent from 1811. Some medical historians have said that George III’s mental instability was caused by a hereditary physical disorder called porphyria. He died at Windsor Castle on 29 January 1820, after a reign of almost 60 years – the third longest in British history. PRINCIPALITY OF BRAUNSCHWEIG-LÜNEBURG – KING GEORGE III. 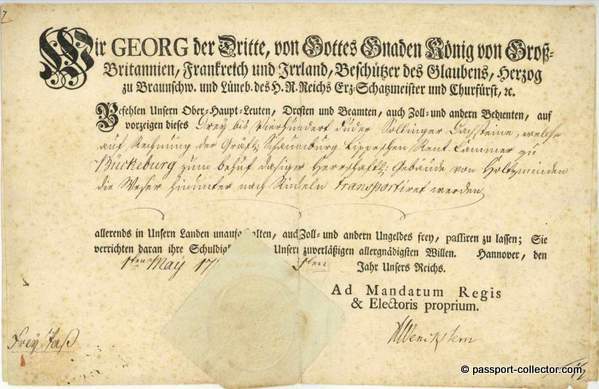 PASSPORT for a delivery of 300-400 Sollinger Dachsteine (roof tiles), which will be transported to Bückeburg for the account of the Rental Chamber of Bückeburg for stately buildings there from Holzminden the Weser down to Rinteln. 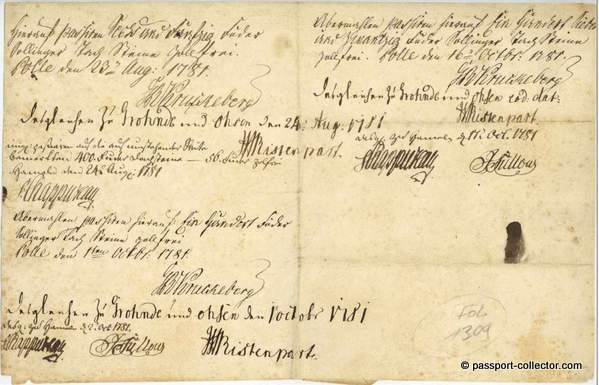 Hannover, 1 May 1781, signed by WENCKSTERN. On the backside numerous visas: Polle, 23.08 (J. B. Kruckeberg), Grohne and Ohren, 24.08. (Ristenpart? ), Hameln, 24.08 (Chappuzeau), Polle, 01.08 etc.). The passport was used for several deliveries and is written in German. What a beautiful document of passport history – and it’s not less than 237 years old! Detlev Alexander von Wenckstern (* 25 August 1708 in Celle;† 13 February 1792) was a German lawyer, Secret Council, Judge, Chamber President and President of the Higher Appeal Court in Celle. Detlev Alexander von Wenckstern lived at the time of the personal union between Great Britain and Hanover. Around 1779 he was a royal British politician, appointed to the Elector Braunschweig-Lüneburg Chamber of Electors “enacted politician”. Friedrich Alexander von Wenckstern, the Hanoverian envoy at the imperial court in Vienna, was his son.